Wyse Technology has updated its Wyse PocketCloud so that the mobile remote desktop app runs on the iPad as well as the iPhone and iPod touch. I reviewed the original iPhone-only app back in March, and little has changed now that PocketCloud is offered as a hybrid app for all iOS devices. And that’s not a bad thing—PocketCloud is a great, amazingly capable thin-client application, but what’s most notable about PocketCloud has more to do with the benefits of the iPad’s larger screen than any changes to the app itself. The iPad’s expanded screen real estate makes it possible to use your PocketCloud for extended periods of time and real work. iPad Ready: The combination of an iPad-optimized PocketCloud and the iPad’s larger screen make Windows on your iPad a real possibility. What is new to PocketCloud is support for the iPad’s VGA adapter, so you can work on an even bigger screen and use an external keyboard if your laptop or desktop computer are out of reach. PocketCloud also supports three new gestures. 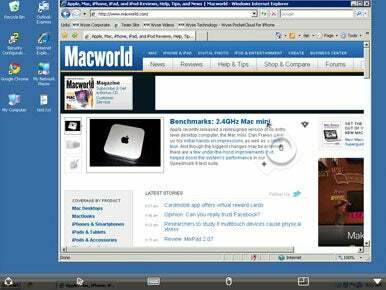 A tap with two fingers brings up the mouse pointer, a tap with three brings up the keyboard, and swiping the screen with two fingers scrolls the contents of any open window. In most cases, the app works great with an external keyboard, with two notable exceptions. First, hitting the Tab key while entering text places a layer of gray on the screen and inhibits typing. This isn’t likely to be troublesome for most regular typing tasks, but it is a hassle if you’re entering information into Web forms or working with spreadsheets. Second, I could find no way to use PocketCloud’s very useful Text pad feature while using the hardware keyboard. Other than that, what I said back in March still holds true: PocketCloud significantly ups the game for remote computer access, now from your iPad as well as your iPhone.